Very heavy - but once in place this will keep a small campervan powered up no problem. Great service from Tanya too! Delivered next day as promised. Fitted as replacement leisure battery on my campervan. I've had good long term performance from the battery, as you would expect from an AGM battery. Excellent price for a battery of this specification and quality, and great service as usual. Excellent performance, true deep cycle marine battery. 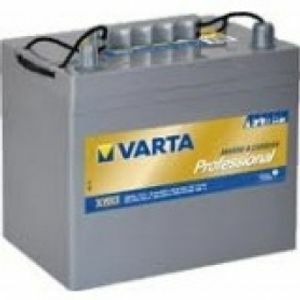 Using a couple of these on a narrow boat for the leisure pack (non starting side).. Whilst the listed Amp-Hours is not as high as other brands of batteries, the performance of these Varta ones more than makes up for this. I think some batteries oversell their capacity, and these appear like a truer reflection. Tayna service excellent as usual - and very good on price. This battery repalces an Enduroline 90Ahr which failed after a very low number of cycles. Thanks to Tayna for a speedy return/refund service. Battery manufacterers don't seem to want you to know the expected cycle life and I now understand for leasure batteries this can be as low as 100 cycles at 50% depth of discharge, where as in discussion with Varta technical they have quoted 800 cycles for this battery -- only time will tell! This was bought as an additional battery. I already knew they were good leisure batteries. This particular size fits two under the Sprinter single seat box. Great comma and price from Tayna, not my first business with them or my last.